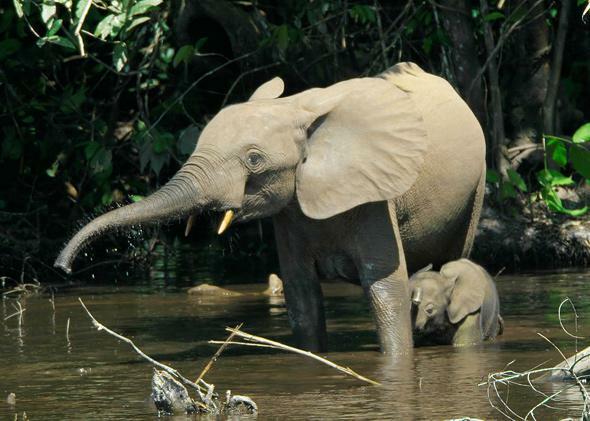 Forest elephants in the Congo Basin: Violence and poaching in the Central African Republic. Violence and poaching in the Congo Basin. Forest elephants in the Mbeli River, Nouabalé-Ndoki National Park, Congo in 2007. Andrea Turkalo is a biologist with the Wildlife Conservation Society. She is based in the Central African Republic but recently had to flee to the United States. She says violence is the latest blow to efforts to save the region’s forest elephants. The society’s online campaign to conserve elephants is called 96 Elephants. Richard Schiffman: How did you come to study elephants in the Central African Republic? Andrea Turkalo: It was an accident. I never thought I would study elephants, but I happened to be in the right place about 30 years ago—the Dzanga Bai forest clearing. It is the most phenomenal location to see forest elephants in the world. So I stayed. RS: You work on the Elephant Listening Project. What does it do? AT: Elephants are very vocal. We use acoustical monitoring to track them in the forest where we cannot see them. RS: What do we know about elephant chitchat? AT: The females do most of the talking, so to speak. There’s no syntax in their language, and we don’t think they form sentences, but they can recognize one another’s voices. Elephants sometimes use frequencies that humans can’t hear—these are the sounds that travel the farthest in the forest. RS: You recently had to flee violence in the area. How has it affected the elephants? AT: Former members of Séléka, a disbanded coalition of rebel groups, are terrorizing local villagers. They are also involved in poaching to help finance military operations. In May they came into Dzanga clearing and gunned down 26 elephants. RS: Was poaching a problem before that? AT: Yes. We have lost 60 percent of forest elephants in the Congo Basin to poaching during the first decade of this century. At that rate, they could go extinct within 10 years. RS: Who’s to blame for poaching? AT: Nowadays, poaching is often run by international syndicates or by outsiders—refugees who have emigrated into our area from the savannah to the north. It appears to be very well-organized. We need a lot more intelligence on who these groups are and where the ivory is going. RS: Are other countries involved? AT: We think so. The Chinese have come into Central Africa in a big way for mineral extraction and logging. Wherever they go, we see elephant numbers decline. Nowadays, traffickers around the globe can go online and find out where these elephants live. Our research group recently put up a photo of a beautiful old male with huge tusks on its website. Immediately, we saw an extraordinarily high number of page hits from China and the Far East. RS: How do local people view poaching? AT: Poaching isn’t always perceived as a real crime. When poachers are caught, a lot of the time they get their wrists slapped, spend a couple of weeks in jail, and are then released to continue the killing. Attitudes need to change. RS: What can be done to halt the decline? AT: We need a return to political stability coupled with the political will to support the wildlife rangers on the ground, and to get serious about punishing the poachers and the people they sell to. It’s also vital to put a lot more pressure on China and other ivory consumers to eliminate demand.